After having 5 kids, there are a few things that we’re fairly particular about. We know what we like and we also know what sorts of gear are worth getting high quality and which we can just get by with something cheap. One thing that we never skimp on is outerwear. It’s really just not worth it. And baby is no exception! 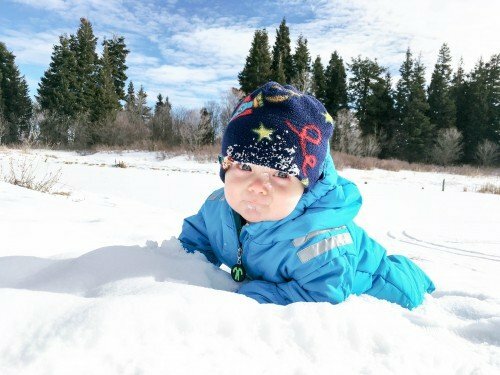 Being on baby #5 now and having been through more infant snowsuits than children, we finally have our all time favorite. 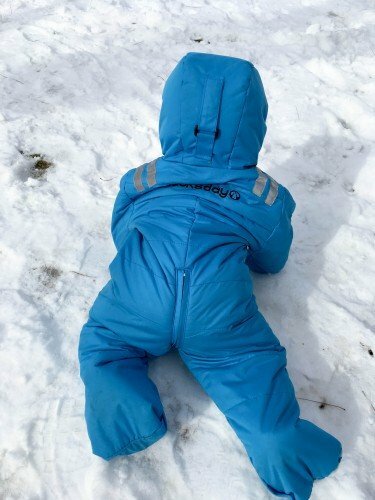 The Ducksday Baby Ski Suit. It’s warm, it’s waterproof, and it has fold over cuffs at both the hands and feet. However, the best part about it is something you never thought would be important – THE ZIPPER!! Now, that might sound a little bit nuts, but hear me out. 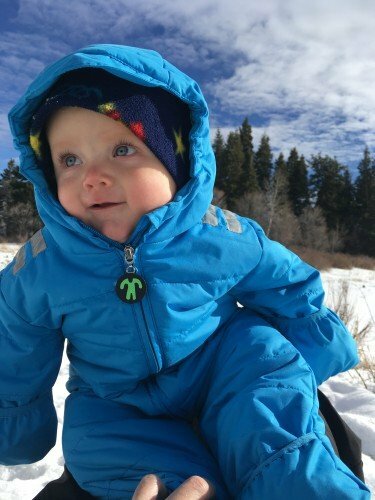 The zipper on this snowsuit goes down the front, between the legs, and then halfway up the back. What this does is that it makes it incredibly easy to get the suit on and off of your baby. 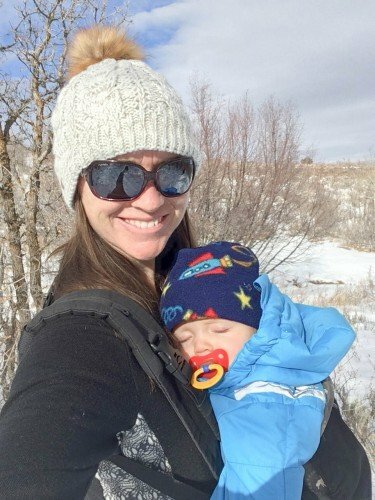 No more trying to wrestle your floppy baby into a snowsuit – just unzip and take care of things one leg at a time. I’m completely in love with this feature. 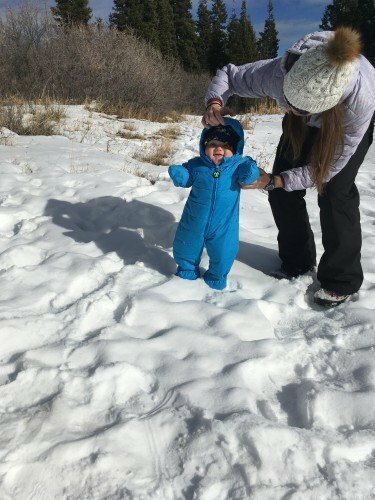 With our baby, we were really worried about how he would adjust to the cold (after only living in really how climates) so we were excited to find this suit. Even though it’s not super bulky, he never feels cold to the touch when we’re out on adventures. I also really love that it’s actually waterproof. Because he’s baby #5, he does actually get put down on the snow A LOT. I mean, pretty much whenever someone else needs help with their gloves, boots, coats, or any of the other 10,000 things that kids need help with, this guys gets put on the ground. No worries – it’s waterproof, he’s warm, so really I don’t need to feel guilty at all. At $90 these suits are not cheap, but I fully expect that it will last through many kids (no, that is not an announcement…I think 5 kids is plenty for us). We had previously owned the Ducksday Baby Rainsuit (review here) and it has already lasted through 4 kids (2 of ours and 2 cousins who used it too). We give this suit our full endorsement and hope you love it as much as we do! Previous articleThe Gift Guide for EVERYONE On Your List! Adventurers, Travelers, Outdoor Lovers, and Minimalists! Do you think this suit would be too warm for a cool spring day? I’m trying to find something good for our damp, windy 40-50 degrees (F) mornings outside. I can’t decide between this and their rain suit.